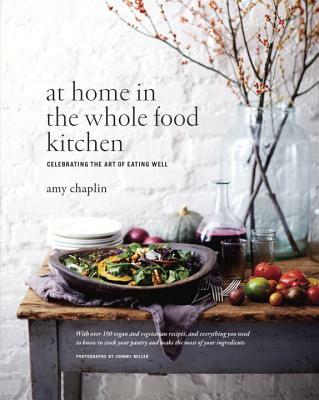 With her love of whole food and knowledge as a chef, Chaplin has written a book that will inspire you to eat well at every meal. Part One lays the foundation for stocking the pantry. This is not just a list of food and equipment; it’s real working information—how and why to use ingredients—and an arsenal of simple recipes for daily nourishment. Also included throughout are tips on living a whole food lifestyle: planning weekly menus, why organic is important, composting, plastics vs. glass, drinking tea, doing a whole food cleanse, and much more. Part Two is a collection of recipes (most of which are naturally gluten-free) celebrating vegetarian cuisine in its brightest, whole, sophisticated form. Black rice breakfast pudding with coconut and banana? Yes, please. Beet tartlets with poppy seed crust and white bean fennel filling? I’ll take two. Fragrant eggplant curry with cardamom basmati rice, apricot chutney, and cucumber lime raita? Invite company. Roasted fig raspberry tart with toasted almond crust? There is always room for this kind of dessert. If you are an omnivore, you will delight in this book for its playful use of produce and know-how in balancing food groups. If you are a vegetarian, this book will become your best friend, always there for you when you’re on your own, and ready to lend a hand when you’re sharing food with family and friends. If you are a vegan, you can cook nearly every recipe in this book and feed your body well in the truest sense. This is whole food for everyone. AMY CHAPLIN has worked as a vegetarian chef for over twenty years. She is the former executive chef of New York’s renowned vegan restaurant Angelica Kitchen, a recipe developer, a teacher, and a private chef whose clients include Natalie Portman and Liv Tyler. Amy’s delicious vegan and vegetarian cuisine has appeared in numerous publications, including Martha Stewart Living, Vogue, Whole Living, New York magazine, the Guardian, and Fitness. She is also a regular contributor to the Food Network’s HealthyEats blog. A native of Australia, over the last two decades Chaplin has worked as a chef in Amsterdam, London, Sydney, and New York. She currently resides in New York City.